Who can forget that idealistic Bobby McFerrin song, “Don’t Worry, Be Happy”? If only things were that easy—especially for Solo Moms. Since March 20 is International Day of Happiness, ESME decided to share some thoughts with you on how to achieve happiness. After all, there is some truth to the common platitude that “happiness is an inside job.” Building inner strength is instrumental in creating happiness for yourself and your kids. And the best part? It doesn’t have to be complex or messy. Let it go. Letting go of perfection and giving yourself a break can lead to happiness. On any given day that you are stretched beyond your limit, trying to do everything perfectly can create even more tension. Being able to accept that not everything can be perfect all the time is sometimes one of the best ways to reach contentment. Find humor. Go ahead and give yourself permission to laugh at yourself. The gluten-free cake you made failed. The calming bubble bath gave you hives. Being able to find the ridiculous in these situations often will help lighten your mood. Try something new. Getting outside your comfort zone might be a bit scary, but the rewards can pay off. Going to a new yoga class or joining a local book group can enrich you in unexpected ways. Think of all the new friends and connections you might make if you simply reach out. Stop comparing. If you find yourself viewing social media photos of others and assume they are happy, think again. Most people tend to project the best possible image of their life, and they want you to believe everything is OK. Very few take photos of the divorce paperwork they just filed nor do they upload their credit-card statement for all to see. Your happiness can’t be dependent on another person’s social media post. Give something unannounced. My late husband introduced me to this idea. He would give a gift and wouldn’t identify himself as the sender. On one occasion, he dropped off the entire Chronicles of Narnia book series through the library return slot as a donation. When he did it, he was smiling from ear to ear. He also anonymously sent a family in need a Target gift card. Sometimes making other people happy can have the same effect on you. Volunteer. After work, once a month, from 7:00 to 9:00 p.m., I volunteer. Even though it is just two hours, I confess that, at times, on my drive to the agency, I find myself complaining. However, each time I leave there, I am beyond content. When you’re giving and making others joyful, the happiness can rub off on you. Be present. Thinking about the past can bring back old emotions that constrict our hearts. Stay present. Begin to develop an awareness of how often your mind wanders to the past, and try your best to keep those reflections at bay. Set a goal. Be sure it is not something you know you can’t achieve. Reaching that goal will not only give you a sense of accomplishment but also brighten your day. Praise your child. Let her know when something she did or said made you happy. Then ask her to tell you, in return, how you put a smile on her face. You are pointing out her positive actions instead of being critical and teaching her to recognize the good in others. Bottle gratitude. Gratitude is something that is often overlooked as a way toward happiness. Teach your child to take note of things that bring him joy. This could be another student, his teacher, or even a sibling. Write them down on a sticky note, and have him place the notes in a jar, which serves as a visual reminder for the family of things, people, and events that you all are grateful for. Demonstrate forgiveness. Your attitude toward others often is reflected in your comments and nonverbal cues. As you know, children pick up on your mood. If a conflict arises in a situation that hurts you, show your child that it is good to forgive. You aren’t happy that a friend offended you, but perhaps the person wasn’t aware or was having a bad day. Open a book. Dr. Seuss and other children’s authors have a special way with words. Reading these or other books to your child is a great way to teach her that reading is a special time. Make time for nonscreen activities. Consider coloring or reading as a family. It might be for just 15 minutes, and you can even make it a game by setting a timer, but the point is that you are doing an activity as a family that doesn’t involve a TV or smartphone. If your child is too young to read, then either have his sibling read to him or find a board book and read aloud. Encourage your child to give. Giving is just as fun as receiving, and helping your child experience giving can be valuable. Encourage your child to give her time or energy to something or someone without expecting anything in return. This doesn’t have to be a lesson in economics, but it is OK to explain that some children would appreciate your child’s gently used clothes. Having your child sort and donate her own items helps her become more aware of the needs of others. Find free activities. There are free things in life, and happiness doesn’t always come with a price tag. My mom became a Solo Mom after my dad died. I was nearly five when he died, but I can still remember her bringing me to the library. It fostered my love for reading, and the activities were fun as well. Museums often have a free family day or days in which they reduce the rates. Check out a local museum with your child, and make it an adventure. Create a happy, kid-friendly playlist. Music is the universal language. Pharrell Williams’ hit song “Happy” is the perfect place to start, and it’s a song that can get anyone dancing. So add it to your “happy” playlist, and then ask your child to identify other songs he likes and make it a family activity. Cultivating happiness within yourself and teaching your child how to create happiness without the use of buying expensive things is one of the most valuable gifts that you can give your child. ESME would love to see and/or hear what you do for International Day of Happiness. Share your thoughts and photos using the hashtag #ESMEHAPPY. 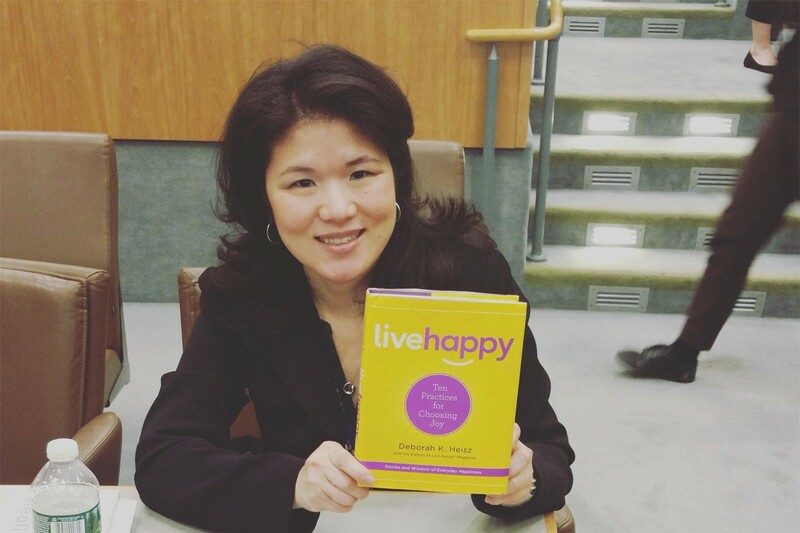 I also suggest reading Live Happy by Deborah K. Heisz. It's great!